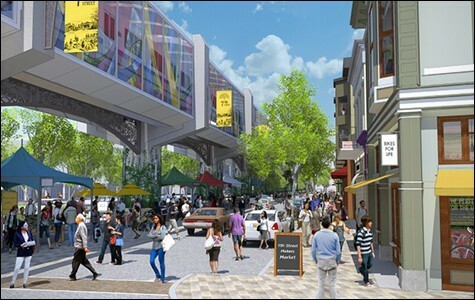 Rendering showing future development in West Oakland, one of the city's rapidly gentrifying neighborhoods. 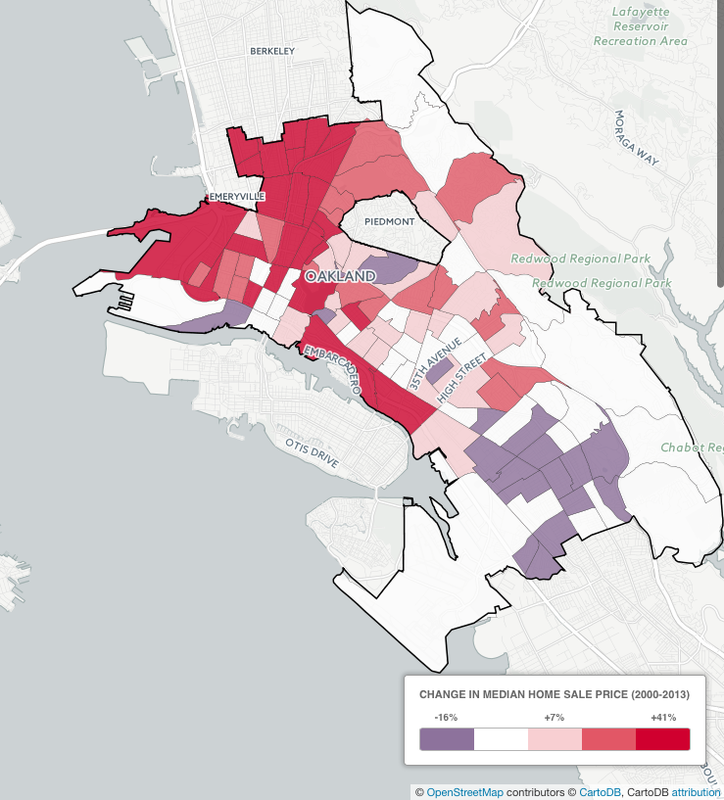 UC Berkeley researchers at the Project For Urban Development released a study this week that pinpoints Bay Area locations undergoing rapid gentrification. 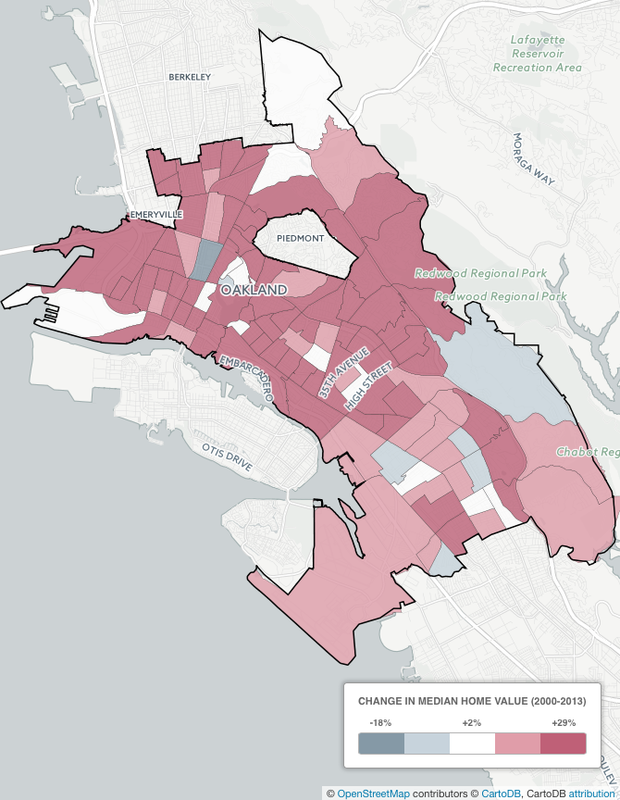 The data — which incorporates property prices, migration patterns, and prevalence of low-income households — suggests that gentrification is extreme in a handful of Oakland neighborhoods, while other parts of the city are either “at risk” of gentrification or are currently experiencing displacement. 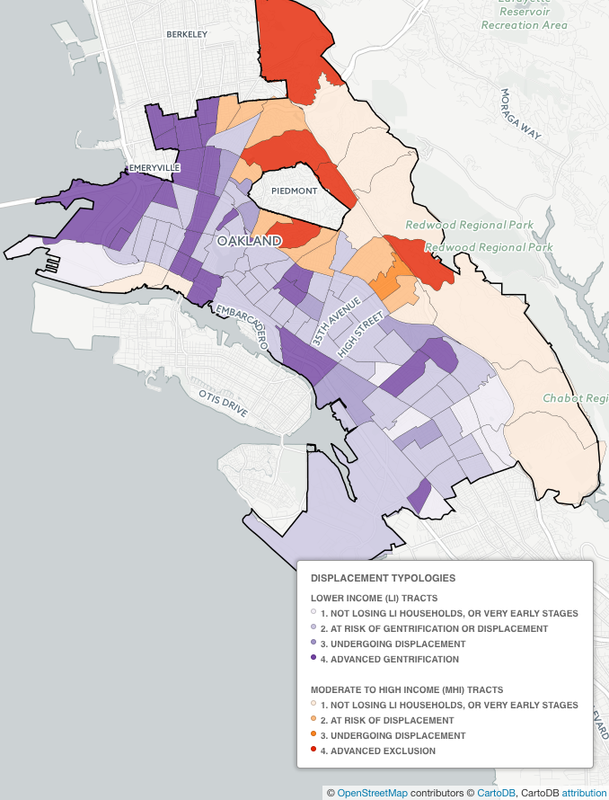 Displacement in the study refers to neighborhoods that are currently losing low-income and affordable housing. Oakland neighborhoods that are experiencing "advanced gentrification," according to the study, include Lower Bottoms, Old Oakland, and Northgate/Koreatown. The researchers define "advanced gentrification" as areas that have experienced significant demographic changes and high levels of real estate investment. Those areas are also very vulnerable to gentrification due to their locations near transit, historic housing stocks, rising house prices, and high rates of market-rate developments. 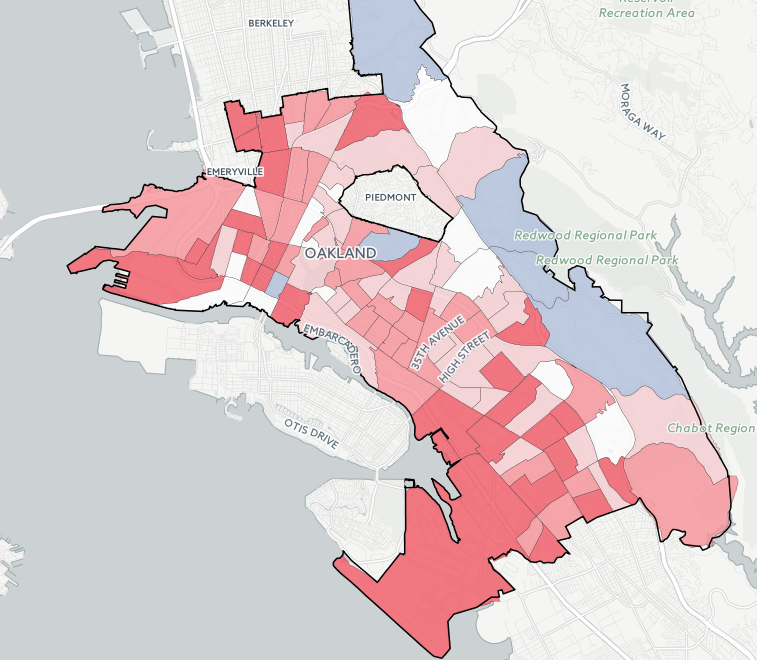 Meanwhile, Lake Merritt, Temescal, and Adam's Point are also currently undergoing gentrification or are at risk of undergoing it in the near future. The researchers also said “the crisis is not yet half over” and that the city can expect the displacement of lower-income households to accelerate in coming years. 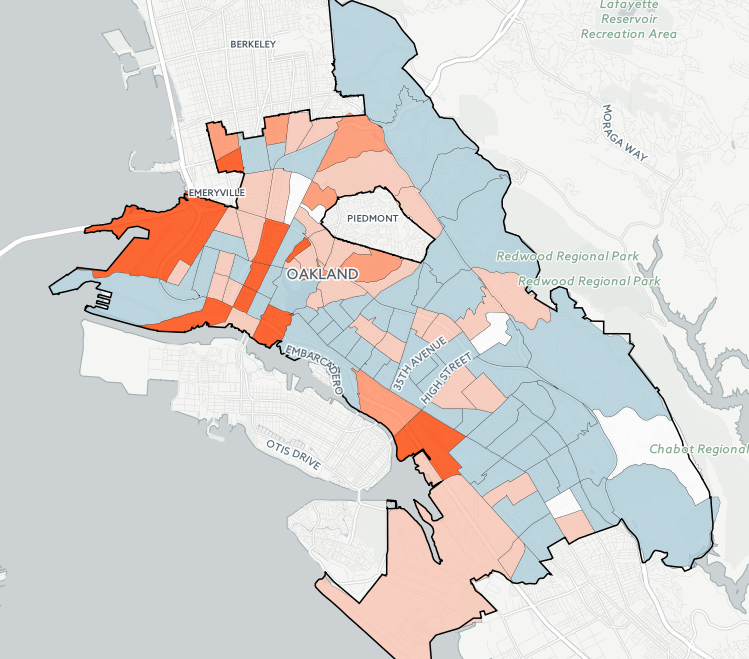 Here are some of the group's maps that illustrate the occurrence of gentrification and displacement in Oakland. You can see more on the handy interactive map published at the Project for Urban Development.